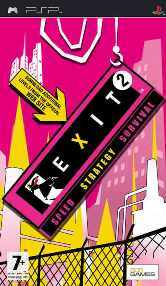 EXIT 2, also known with title Thinking Exit, Kangaeru Exit (in Japan) or Exit 2nd is an action and puzzle video for PSP (PlayStation Portable), and is sequel to the popular EXIT game. As illustrated from the named of “Thinking Exit”, the EXIT 2 focuses on puzzles rather than action. The sequel was released on September 2006. Exit 2 game trailer is considered by some gamers to be one of the best trailers for PSP games. Take a lot at the attractive trailer again which also demonstrates EXIT gameplays. The basic of EXIT is pretty easy. Player is to lead the main character Mr. ESC, an escapologist, out of hospitals, underground facilities, offices and other buildings within a time limit. Along the way, the player will be hindered by obstacles such as fires or even earthquakes. Sometimes the player must help trapped individuals escape as well, and it will take quick thinking and planning ahead to exit the building successfully.